Here’s a list of zine and DIY events coming up in the UK. If you’d like to see which ones we’ll be attending or involved with, have a look at our Events and Fairs page. If you’re hosting or know of an event we should feature here, please contact us and we’ll add it! 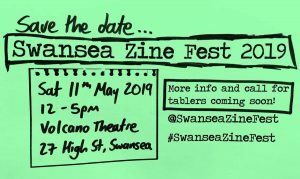 Zine Nation also has listings of worldwide zine fests here. More info TBA. Applications currently open here. Copyright © 2019 pen fight. Powered by WordPress and Themelia.